For any technical support, please visit our forums. Prepar3D v4.1 is available now! The Prepar3D team is excited to release the first update to v4! We have been hard at work building upon the major changes made in version 4 to continue making Prepar3D the most feature-rich, stable, and performant training platform available. This release includes numerous enhancements, new features, and bug fixes based on user and developer feedback. Virtual Reality (VR) is now available in any view and includes an interactive mouse pointer enabling cockpit interaction. Aircraft interiors are brought to life with support for 4k textures and cockpit rain effects. Many updates were made to further improve stability, add-on compatibility, and performance in this release. 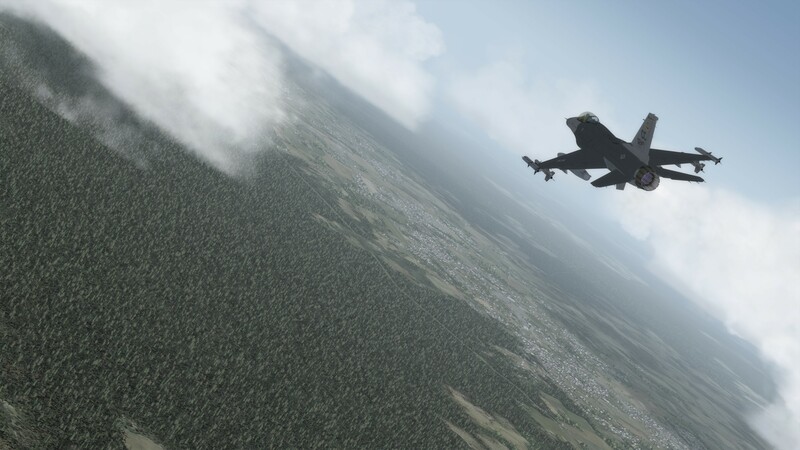 Trailing the F-16 in Prepar3D v4.1 – Download v4.1 today! The development pipeline and toolset has been updated to further optimize complex models. New features to the Prepar3D Development Kit (PDK) include built-in support for cockpit rain and snow visual effects, support for 3D window positioning, advanced samples for Helmet Mounted Displays (HMDs) and targeting pods, and stability improvements and bug fixes throughout the content creation process. Prepar3D is focused on giving developers the tools they need to be more efficient and create the highest quality products available. The Prepar3D v4.1 update is available now and can be downloaded from the Downloads page. If you currently own a valid Prepar3D v4 license there is no charge to update to Prepar3D v4.1. To purchase Prepar3D v4, please visit our online Store. Prepar3D offers separate updates for the Client, Content, and Scenery. This will make updating faster and easier than ever before. Please be sure to read the Prepar3D v4 Download and Installation Instructions for more details on how to quickly update to the v4.1 release. It is strongly recommended to only download and install the Client as there are only minor updates to content and scenery for this release. Please refer to the What’s New below to see if these fixes are required for your training needs. The Prepar3D v4.1 release brings many exciting changes and enhancements to the platform. The Client installer is required for Prepar3D v4.1, however the Content, Scenery, and SDK installers are optional. You must first have Prepar3D v4 installed to utilize the Client only installer. To install the Prepar3D v4.1 Client, you must first uninstall the Prepar3D v4.0 Client via Programs and Features in Windows Control Panel. The Prepar3D v4.1 Client update will require you to reactivate your product, however if you have an internet connection it will be automatic. We hope you find that Prepar3D v4.1 continues to be the most immersive learning, simulation, and training platform available.